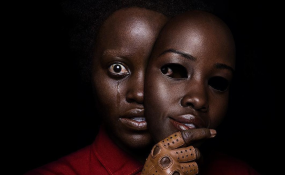 Award winning actress Lupita Nyong'o's latest film Us raked in an estimated Sh7 billion in ticket sales in the United States to become the largest opening weekend for an original horror movie. According to The Hollywood Reporter, the movie is now the third-best horror opening of all time. Us, which also stars Winston Duke, is about a couple fighting off doppelgangers while vacationing with their children at a Northern California beach house. An excited Nyong'o took to social media to thank her fans who lined up to watch the film. Over the weekend, Lupita received lots of publicity, gracing many newspapers and headlines including The New York Times, for her role in movie. "What a way to end opening weekend! I've felt the support all around (woweee New York Times this week!) and am grateful for this moment. I'm having so much fun and looks like many of you had a scary good time at the theater this weekend too." What a way to end opening weekend! I've felt the support all around (woweee New York Times this week!) and am grateful for this moment. Us centers on the Wilsons, a seemingly normal middle-class family of four, on vacation at their summer home near the California coast. Accompanied by her husband, son and daughter, Adelaide Wilson (Lupita) returns to the beachfront home where she grew up as a child. Haunted by a traumatic experience from the past, Adelaide grows increasingly concerned that something bad is going to happen. Her worst fears soon become a reality when four masked strangers descend upon the house, forcing the Wilsons into a fight for survival. When the masks come off, the family is horrified to learn that each attacker takes the appearance of one of them. Us is Jordan Peele's latest politically resonant horror movie and is his the second smash-hit directorial debut, after Get Out.